Rajasthan JET 2019 (Rajasthan Joint Entrance Test) is a state level examination. 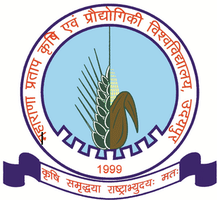 Maharana Pratap University of Agriculture and Technology, Udaipur Organises the entrance test of Rajasthan JET every year. Candidates who fulfill the eligibility criteria can apply in online mode; candidates are advised to fill the application form through online mode. Only the domiciles of Rajasthan are eligible to apply for the exam. Admit card will be allotted only to those who successfully registered for the entrance exam. In this section, you will find all the information related to Rajasthan JET 2019 such as eligibility criteria, syllabus, important dates, results, counseling. University has not released anything yet regarding Rajasthan JET 2019. The section will be updated once there is an official announcement. Following are the expected schedule of JET 2019. Candidates should read the notification carefully that is available on the official website. Candidates should make sure that they are eligible to apply. Students should fill out all the required information to apply. Can pay the application fee by opting for net banking or by debit card. Candidates should provide a photograph image, signature image at the time of filling the application form. The candidate will be disqualified if the signature provided in the application form does not match at the time examination. If the candidate feels that there is a need to edit the information that was provided by him he/she can do it by edit option until the last date of the application form. Following are the details of the application fee according to last year. A bonafide resident of Rajasthan and except Rajasthan should be studying in any one of the states. The parent of the candidate is a retired government employee of Rajasthan or related bodies. Parent of the candidate is a judge of the high court; candidate should submit an undertaking stating that this kind of benefit is no availed in any other states. Candidates must pass with 50% of marks in 12th class which is conducted by the Board of Secondary education, Rajasthan, Ajmer in any of the subjects; Agriculture, physics, chemistry, mathematics, biology. Relaxation: 5% for SC/ST candidates. *common entrance exam for all the courses. Official curriculum of Rajasthan JET yet to be announced by the exam conducting bodies. Admit card will be issued during the 3rd week of May 2019. It can be downloaded through online mode from the official website rcaudaipur.com. Admit card contains the basic details of the applying candidate such as candidate name, address, seat number, centre, etc. no admit card will be sent to any of the students through the post. It is suggested to keep the admit card with the student until all the process of admission is completed. Here, we will discuss the details about the result for Rajasthan JET 2019. Results of Rajasthan JET 2019 will be declared on the first week of June 2019 tentatively. Exam participants can check their results through an official website. Candidates have to enter their details such as registration number, password, to view the results. A short list of candidates is prepared by the performance by students in Rajasthan JET. The conducting authority will prepare merit list by individual performance. Only the qualified students are eligible to appear in Rajasthan JET 2019 counselling. The counselling process will be strictly based on the performance of the students. Counselling will begin in a few days after the declaration of result. All the eligible candidates (merit list students) are invited for counselling. Admissions will be strictly based on the merit list of candidates. By choice preferred by the candidate, vacancy of seats, the seat will be allotted. Counselling will be in different rounds. Qualified candidates should bring all the original documents with them. It is mandatory to pay 5000 INR with option form to confirm the seat. How will I get the Rajasthan JET 2019 Admit Card? The admit card for Rajasthan Joint Entrance Test 2019 can be downloaded by the official website. Can I submit the Application Form offline? No, the application form for Rajasthan Joint Entrance TestT 2019 cannot be submitted offline, you have to fill the application form online. Is there a difference between Hall Ticket and Admit Card for Rajasthan JET 2019? No, there is no different in the hall ticket and admit card for Rajasthan Joint Entrance Test 2019. Where can I report mistakes in my Rajasthan Joint Entrance Test 2019 to admit card? You need to contact the conducting authorities immediately if you find any discrepancies in your Rajasthan JET 2019 admit card. No, the correction period will not be provided to students after the application form process finishes. For any queries regarding Rajasthan JET 2019, please comment below. Hello, very useful information provide you. Thank you for this information. what is process of fill the registration form of Rajasthan JET exam ? Sir paper are both langauge hindi and English ? Hi, Can you give me last 5 year sample papers of Rajasthan JET 2019 Exam ? What is Application Fee process of Rajasthan JET 2019 Exam ? Online mode or offline mode. hello sir I have completed my 12th with 49.98 %. So any chance can i fill the application form of Rajasthan JET 2019 Exam ? What is the application fee of general category student and how many difference between General category and Sc/St category cut-off in Rajasthan JET Exam ? Hey, can you give me more information about Rajasthan JET 2019 Exam Pattern, like which type of comes question in Physics, chemistry, maths ? how many times aplly Rajasthan Jet entrance exam ? what is process of fill the application form of Rajasthan JET 2019 exam ?